5/31/11 - Pledges reach $520,000! There are still a number of potential contributors looking to support the project so show your support if you have not already! 5/9/11 - Pledges topped $450,000 today. We still need a number of outstanding pledge cards to help us reach our goal of $800,000 pledged. Print a card from the tabs at the left or email us and we can send you one via email or US Mail. 4/26/11 - $300,000 in pledges to date - print pledge card and from options to at left and mail to address at the bottom of the home page! 4/14/11 - 13 Pledges net $62,600 at Pledge Party! $6,000 received today in mail in pledges! Please have Pledge Cards in by Thursday, 4/21. Mail to Triad Swimming Foundation, P.O. Box 16357, High Point, NC 27261. 4/12/11 - $53,000 Pledged Today taking Total to Over $100,000 before Pledge Party on Wednesday! Hope to see you there! 4/11/11 - Anonymous Pledge of $20,000 made to be paid in May! 4/10/11 - Kimberly & Norris Baker Commit to Name Women's Locker Room in Honor of Daughters Rachel and Kathleen! Come visit and see the facility. Hope to see you there! 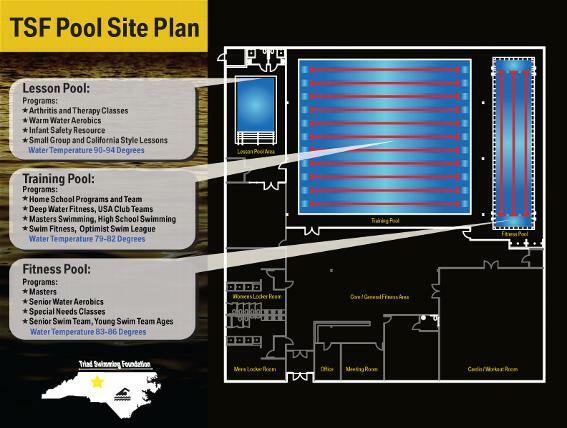 The TSF is currently in the process of raising funds to develop a new Aquatic Facility in the Clemmons area of North Carolina, just outside of Winston Salem, to create an opportunity to offer programming that is currently limited in the area due to the high demand for pool space and the lack of it's availability. The cost of the total project is between 2.5-3.0 million dollars and is on a tight timeline as the goal is to be in the facility by the end of September. Fundraising and Pledge drives are already underway with several groups that are in support of the facility and we have already meet with contractors, builders and structural engineers so look for drawings soon! The facility will have three pools with distinct purposes. A Training pool with 10-11 lanes and a temperature around 80 degrees that will be used for outreach programs, High School swimming, competitive swimming along with several other groups. There will also be a 3-4 lane Fitness pool that will have a temperature between 83-85 degrees that will be used for lap swimming, fitness classes, aerobics , lessons and special needs groups. Finally, there will also be a smaller Lesson pool with warmer water (91-94 degrees) for lessons, special needs classes, water therapy classes and other warm water activities. There will be several open houses at the facility once the initial drawings are in place so that everyone can see the layout and plans for the upcoming facility. This will give everyone a chance to see what all of the excitement is about and how the facility can benefit the community and fit your families wellness and aquatic needs.